Checkerberry in bloom in July along a trail in Westborough. The plants flower in summer, producing nodding, bell-shaped white blossoms. Snows have fallen and then melted a few times in the past several weeks, revealing "wintergreen" plants that typically stay green under the snow all winter, most notably checkerberry, the original source of the flavor and fragrance that we know as wintergreen. Checkerberry (Gaultheria procumbens) is a common find along most of the woodland trails in Westborough. It is native to the eastern U.S. and reputedly can survive winter temperatures as low as minus 40 degrees Fahrenheit, far lower than we ever get in Westborough. The plants are low, growing only 3 to 6 inches high. At this time of year, the leathery oval leaves understandably look a little beat-up, but they're still green. They may be slightly tinged with red. Checkerberry is easy to identify by its wintergreen scent, even in the winter. Simply pick a leaf, tear it in half a couple of times, and give it a sniff. If it smells like wintergreen, it's checkerberry. If there's no odor of wintergreen, it's one of several other small plants that stay green throughout the winter. You may discover that some checkerberry plants still sport a waxy red berry or two during the winter. The fact that the berries last into the winter or even the spring is a big clue that they are not especially nutritious. When nothing better is available, chipmunks, deer, squirrels, and grouse will eat them. All parts of the native checkerberry plant have an aroma of wintergreen. 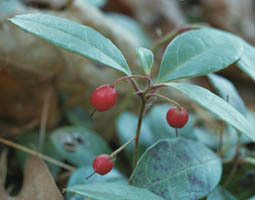 The red berries appear in the fall and often last through the winter. July is another good time of year for enjoying checkerberry. The plants flower then, producing nodding, bell-shaped white blossoms. Woods with oaks and white pines are good places to look for checkerberry. It does well in the acidic soils typical of our area. You can find it year-round in shady, open woods along the trails at the Headwaters Conservation Area (Andrews-Nourse, Mill Pond area), the Bowman Street Conservation Area (Westborough Reservoir), the Libbey property, Wile Forest, Lake Chauncy, the Sudbury Valley Trustees Walkup and Robinson Memorial Reservation, the Sudbury Valley Trustees Sawink Farm, and many more places. Some large patches of checkerberry grow in the open in the power line cut that crosses the path from the Haskell Street ball field to the Greenleaf Canopy Trail (built by the WHS Environmental Club) in the WCLT Hero property. The plants can spread by underground runners and serve as a ground cover, as you can see in this area. Checkerberry was once the source of oil of wintergreen, used to flavor chewing gum, candies, beverages, medicine, toothpaste, and mouthwash. 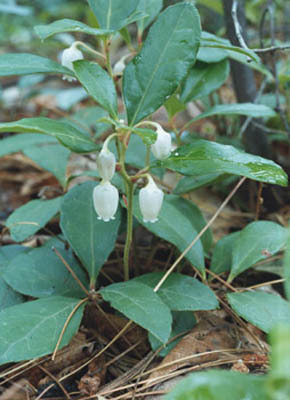 Oil of wintergreen was extracted from the leaves by a steam distillation process. Eventually an oil extracted from the bark and sap of black birch trees (Betula lenta) replaced it as a flavoring agent. Today a synthetic chemical is used to give a wintergreen flavor to commercial products. Going further back, Native Americans had numerous medicinal uses for checkerberry. They made a tea from the leaves to treat colds, headaches, fevers, rheumatism, and difficulties in breathing. They also applied it externally for bodily aches and pains and sore joints. European settlers adopted these medicinal uses and more into their folk medicine. They found checkerberry helpful in treating sore throats, tooth decay, skin diseases, inflammation, bladder ailments, and asthma. What made "wintergreen" so useful in the medicine of the past? It turns out that checkerberry contains methyl salicylate, a chemical compound related to the active ingredient in aspirin. The extract, oil of wintergreen, contains a high proportion of this chemical and, like aspirin, can be extremely toxic. Because checkerberry was once popular for making a tea, another name for it is eastern teaberry. The best tea was apparently made not from fresh leaves, but from fermented leaves. Some hikers find it refreshing to chew on a leaf (but without swallowing it) or to nibble a berry while they're walking through the woods. Checkberry is a member of the heath family (Ericaceae), along with blueberries, cranberries, azaleas, rhododendrons, and mountain laurel.